SmartStix I/O is a new terminal-block style I/O designed for use with the the XL series Operator Control Station (OCS). It can be used to expand the I/O capacity of any OCS, and it is very cost effective as remote I/O. SmartStix I/O connects to any OCS CsCAN network port to provide the best I/O selection for the application. And, output modules feature Electronic Short-Circuit Protection (ESCP). SmartStix I/O is extremely compact, providing 16 and 32 point digital I/O in a package only 39 mm (1.5") deep and a footprint of 50 H x 116 W mm (2 x 4.5") or 50 H x 177 W mm (2 x 7"). With its small footprint, SmartStix I/O takes up very little panel space whether located in the main control panel or tucked away in a remote location. 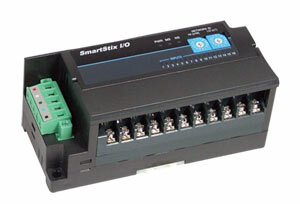 SmartStix I/O has a barrier style terminal strip and can be mounted on a DIN-Rail. Plus, removable terminals make field replacement fast and convenient. SmartStix I/O easily expands the I/O capacity of any OCS utilizing the CsCAN network port available with every model. It is especially cost effective when added to an XL Series OCS. SmartStix I/O offers fast response times without sacrificing robustness, with no need for a costly I/O interface unit. In addition to its peer-to-peer capabilities, CsCAN is used as a highly efficient method of distributing SmartStix I/O up to 1829 m (6000')* away. SmartStix require minimal time and complexity to configure. Just assign a unique ID, connect the 5-wire shielded cable and you will be up and running in no time. * Maximum distance is 457 m (1500') per segment, with up to 1829 m (6000') possible using repeaters. 참고: SmartStix I/O module comes with a 5-pin terminal style network connector. An optional m12 adaptor for m12 cable sets is available. SmartStix I/O have removable terminals and can be DIN-rail mounted.